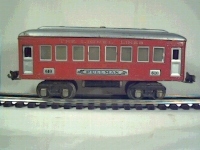 The late body 610 and 612 Passenger cars. 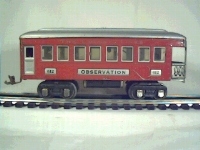 The 610 passenger car and the matching 612 observation were introduced in 1926 and cataloged through 1930. These cars were also made as uncataloged specials continuously from 1934 through 1937 or 1938. Unless otherwise noted these were three car sets. 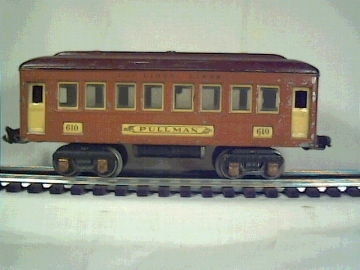 Two car sets have a Pullman and an Observation; three car sets have two Pullmans and an Observation. 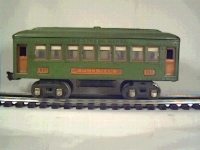 When these cars came with electric outline engines the engine is usually the same color as the cars. As always, cars are shown in order of production, with the earlier colored cars first. All cars have gold lettering unless noted. 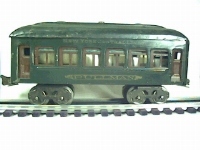 These cars replaced the early bodied 610, 612 cars introduced in 1915. They are nice cars with lots of variations for the collector to seek out. Most variations are easy to find and relatively inexpensive. Cataloged cars have white strips along the tops of the windows; while uncataloged cars do not. If there is no strip on the cars in the pictures below, it is because the strip has been lost over the 70 years since these were made. 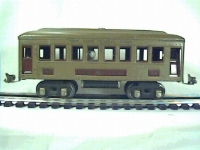 The car on the left is an early bodied 610 passenger car. These cars were made from 1915 to 1925. 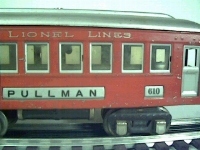 Notice the early car is more rounded and does not have inserted name and number boards. The insert on both cars is one piece of metal held in by tabs that go through it. The early car has double windows while the later has single windows. 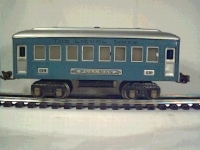 The later car also has added air tanks. Although it doesn't show in the picture the early car is shorter at 8.25 inches than the later 8.75 inch cars. The early car is about a quarter inch taller though. 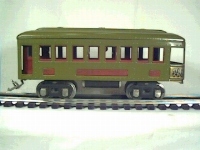 There are at least five and possibly seven color variations of the early car. The basic body colors are dark green (shown), mojave, and maroon. With maroon being the hardest to find and dark green being the easiest. 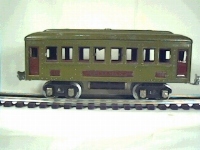 The early bodied cars came in sets with the 703, the 156, the 253, and the 254. I will add a page about the early style cars in the future. Mojave, maroon inserts. Mojave cars also came with red inserts- red is harder to find. Came in sets with the 253 electric. 1926-1927. Many sets have a combination of red and maroon inserts. 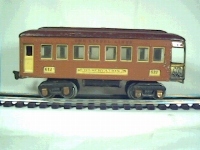 These mojave cars can also be found lettered New York Central Lines above the windows instead of the more common Lionel Lines. 610 Olive green, maroon inserts. 612 Olive green, red inserts- red is harder to find. Came in sets with the 254 electric. 1926-1927. 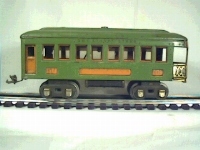 Olive cars also came with orange inserts which is quite harder to find than red or maroon. Terra cotta, maroon, cream. Uncataloged circa 1933 or 1934. Note these cars- and all the cars below have the later trucks with the two triangles. 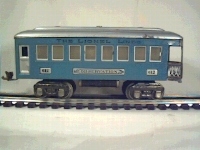 This is the ex-Ives truck and was not used by Lionel until 1933 when it replaced the early trucks with the rectangle cutouts. I don't know what engine came with these cars. 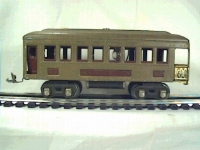 It could have been a 262 steamer or a matching terra cotta/ maroon 253. If you have a boxed set with these cars please send me an email so I can add the engine information. My email address is at the bottom of this page. These cars are the same color- the light must have moved! Light blue, aluminum roof and inserts. Black lettering. Nickel observation railing. Uncataloged circa 1935. I don't know what engines came with these cars either. Possibly a gunmetal 249E or a black 261E. If you have a boxed set with these cars please send me an email so I can add the engine information. My email address is at the bottom of this page. Light red, aluminum roof and inserts. 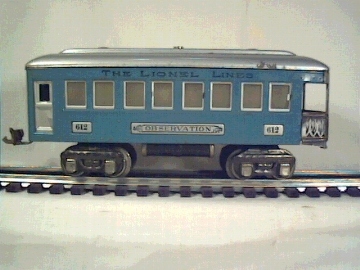 Black lettering on inserts; silver Lionel Lines above windows. Nickel observation railing. Comes with block or scroll lettering. Uncataloged circa 1935. I don't know what engines came with these cars either. Possibly a gunmetal 249E or a black 204. If you have a boxed set with these cars please send me an email so I can add the engine information. My email address is at the bottom of this page. These two pictures show the different lettering styles. The scroll style on the left was used on all the car colors. 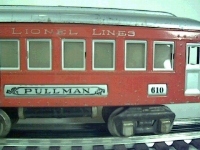 The block style on the right was only used on the last run of the red cars. Note that these cars have different window material. Not shown: Red, cream inserts. Special for Macys'- lettered Macys' Special above the windows instead of Lionel Lines. Came in sets with the red 450 locomotive. Rarity: The blue and aluminum cars and the red Macys' cars are very hard to find. The Terra cotta, maroon is also quite difficult to find, but does not get the attention of the other two colors. All the other colors are quite easy to find. 610 Terra cotta, maroon, cream. Uncataloged circa 1933 or 1934. 612 Blue, aluminum roof and inserts. Uncataloged circa 1935. I am trying to keep the size of the images down so they load faster and take up less space, but I did want to include some larger images because the detail is better. I figured these two big pictures would be loading while you're reading the text above.